is a staple of the holiday season. 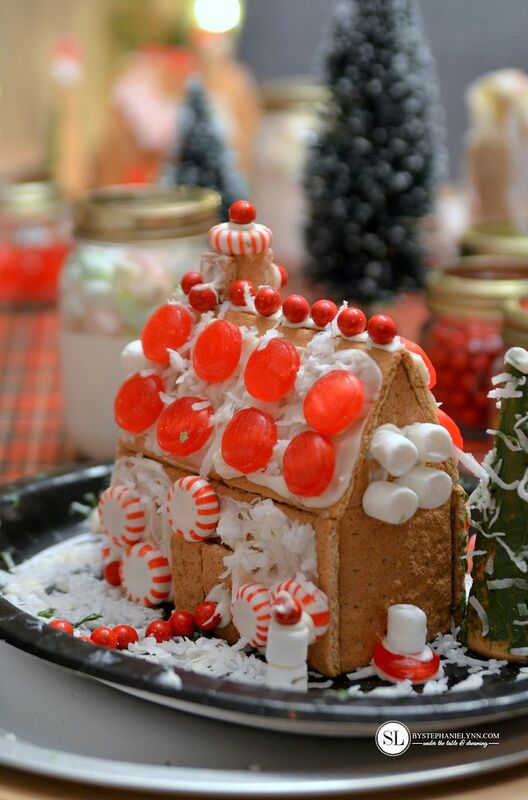 Captivating miniature works of art – mounds of icing and sugared candies – creativity only limited to the imagination. Over the years we have turned this traditional family affair into a fun-filled celebration, we anxiously look forward to each December. 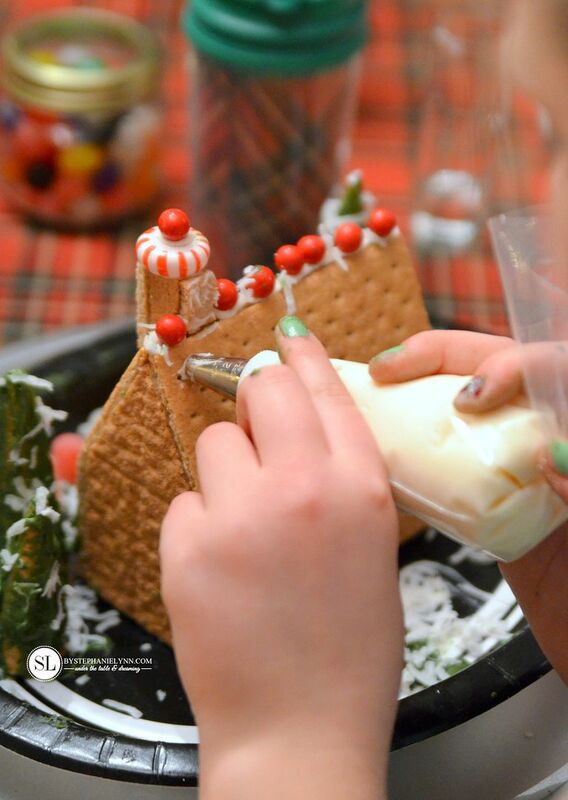 Our annual Gingerbread House Decorating Party has become one of my favorite parties of the year. Multiple sets of little hands, simultaneously creating their own masterpieces makes my heart melt. 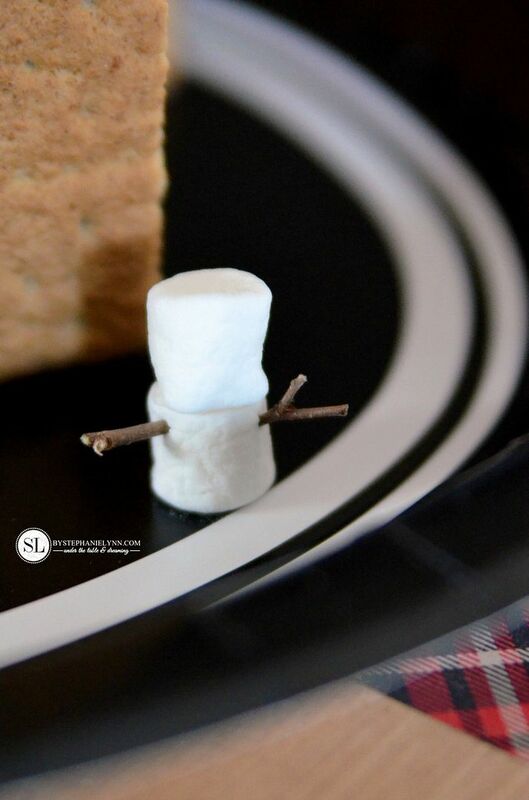 Below you’ll find the complete party plan for this year’s soiree, along with a few tips and tricks to create a fun-filled, stress free event. 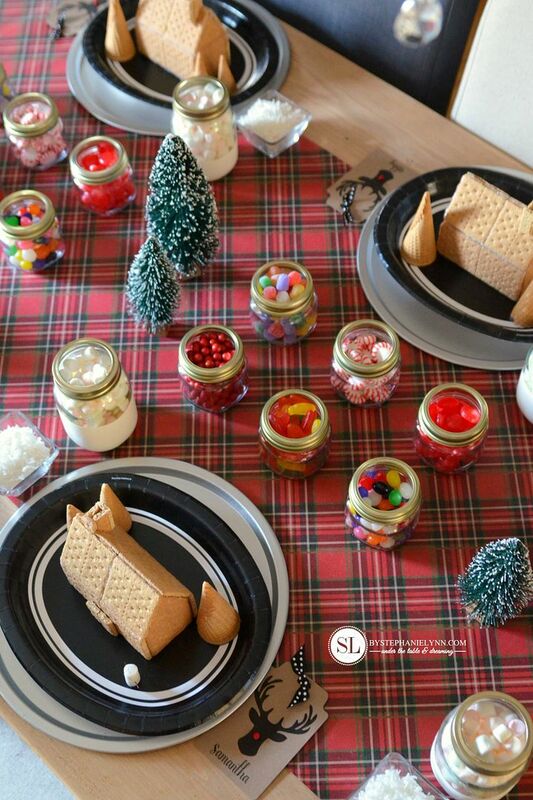 There are also some free printables included at the end of the post to help get you started and plans for an easy Snack Pack Pudding Bar, as well. 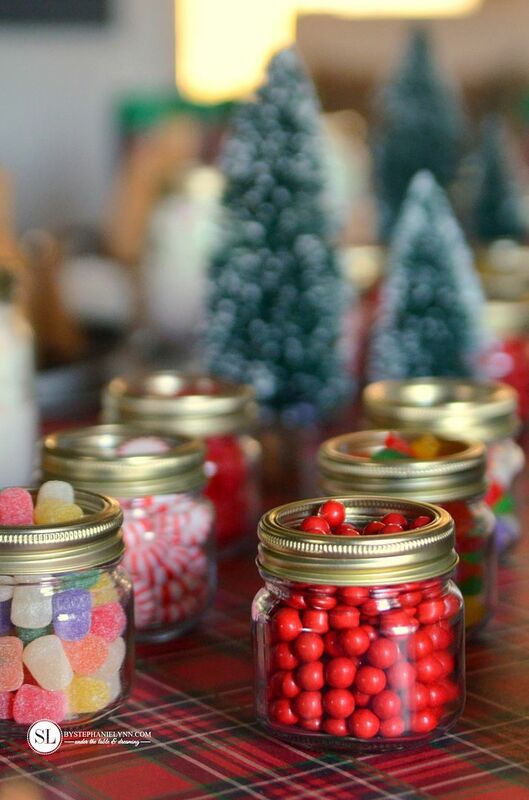 turn on the holiday tunes and let the decorating begin! 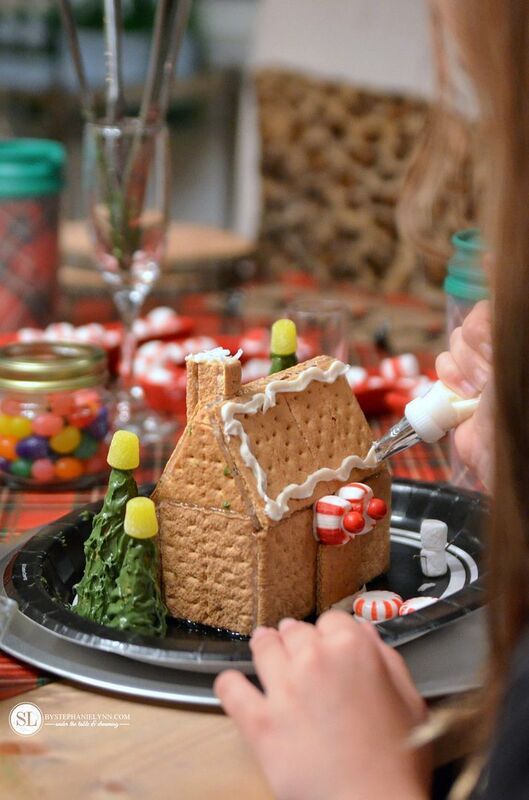 For the past few years we have been making our gingerbread houses out of Honey Maid Graham Crackers. 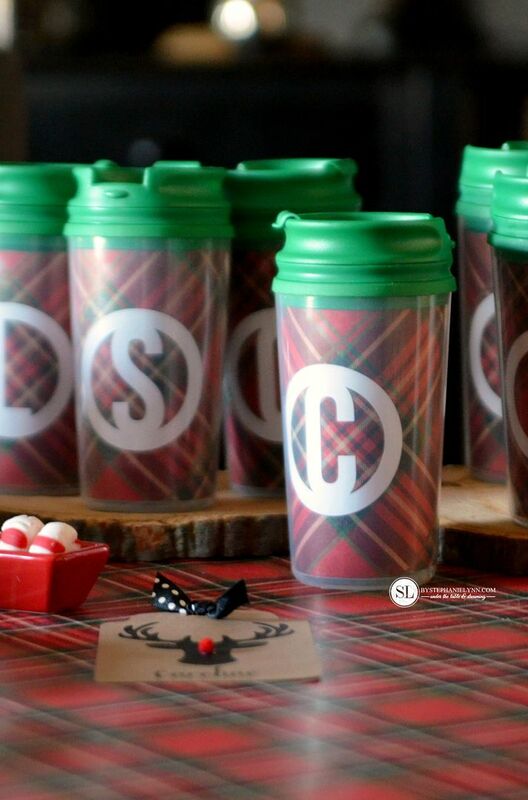 It’s a quick and easy solution if you are planning on hosting a party with several attendees. especially since all of our attendees are younger children. 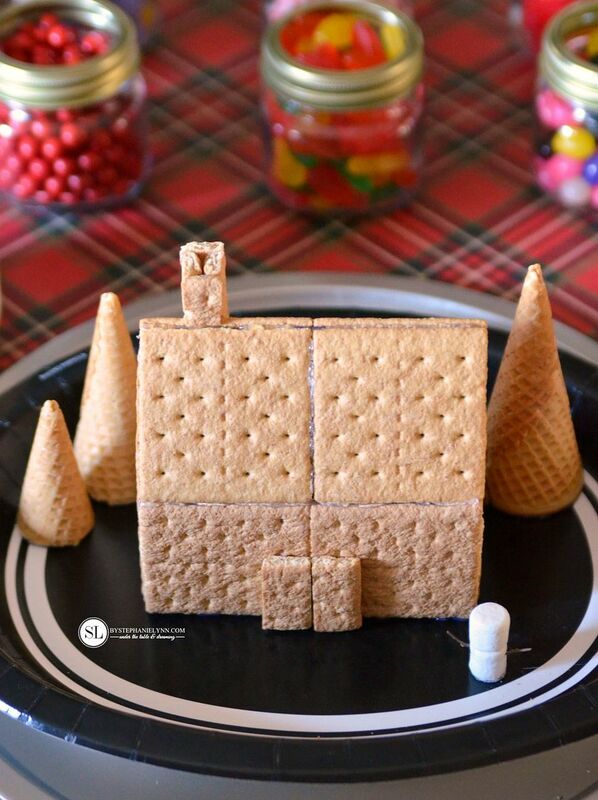 All of graham crackers used to build the houses are glued together using a hot glue gun. The houses are then glued to a disposable plate. Don’t worry too much about the exposed glue as it will be covered with all of the glorious toppings and icing. Although this prevents the houses from being eaten, it does make them very stable to work with and sturdy enough for guests to transport home. Plus, it allows you to display the houses all season long! 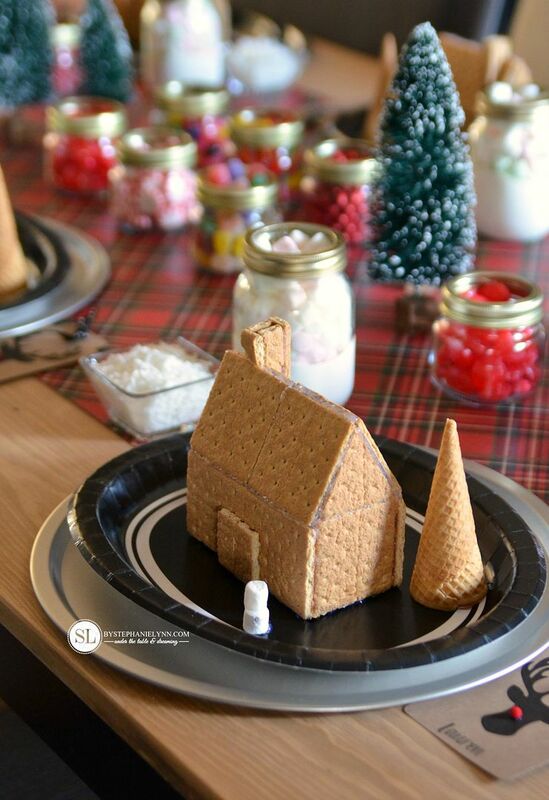 Along with the houses, this year we created a perfect winter scene by adding some Comet Sugar Cone trees and marshmallow snowmen to the plates. 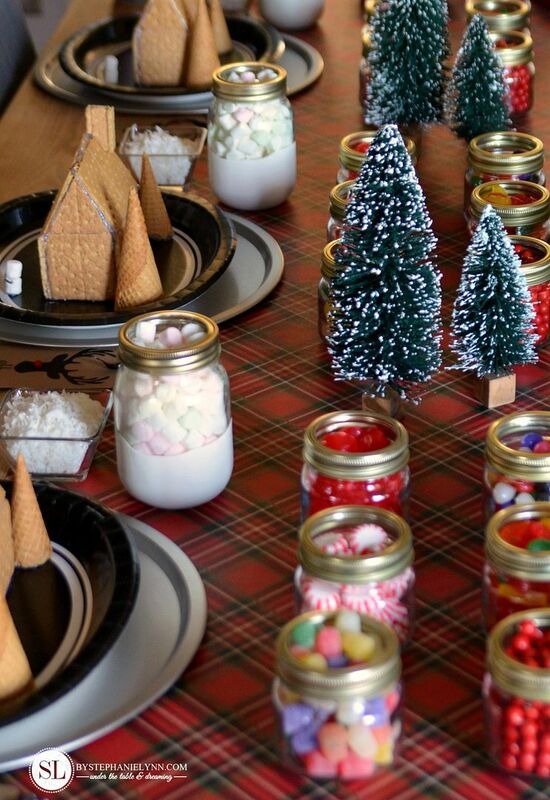 A Gingerbread House Decorating Party is not complete without an array of decorative toppings. 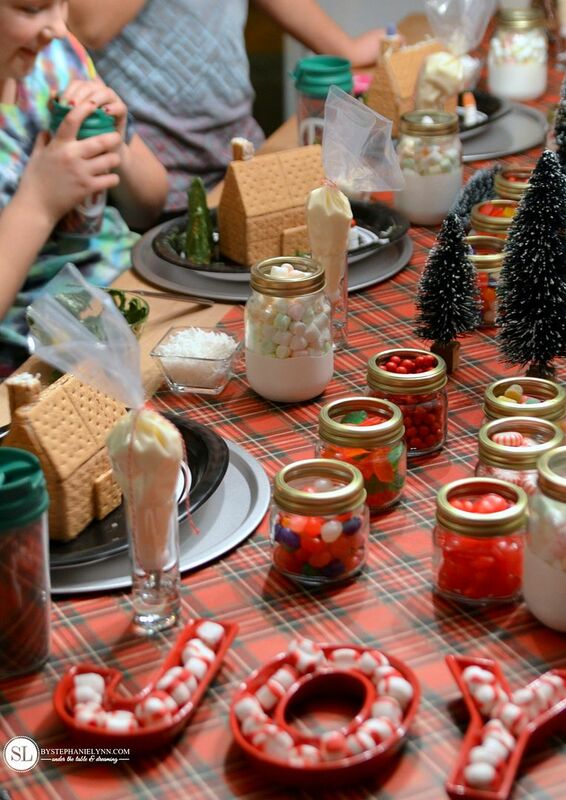 This year’s toppings include hard candies, jelly beans, peppermints, Swedish Fish, gumdrops, red candies, marshmallows and coconut (for snow!). The toppings do not have to be extravagant to create masterpieces. We conveniently picked up all of our toppings right at our local WALMART and simply used the store brand selections. 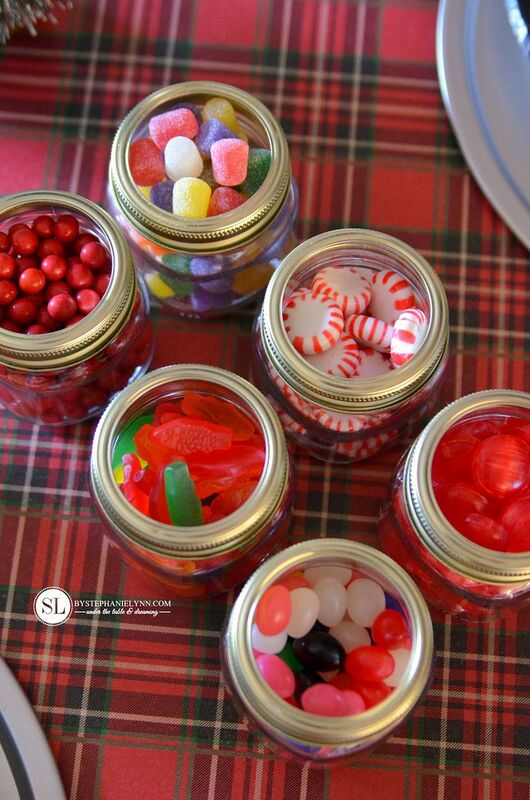 To help keep things organized and tidy, the toppings were placed in several individual mason jars, down the center of the table. 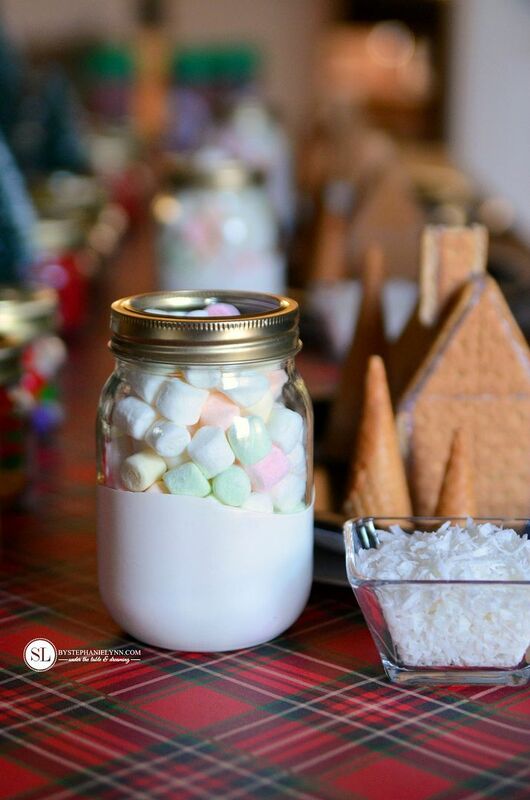 Since marshmallows and coconut are always big hits, individual containers of these toppings were placed at each place setting. 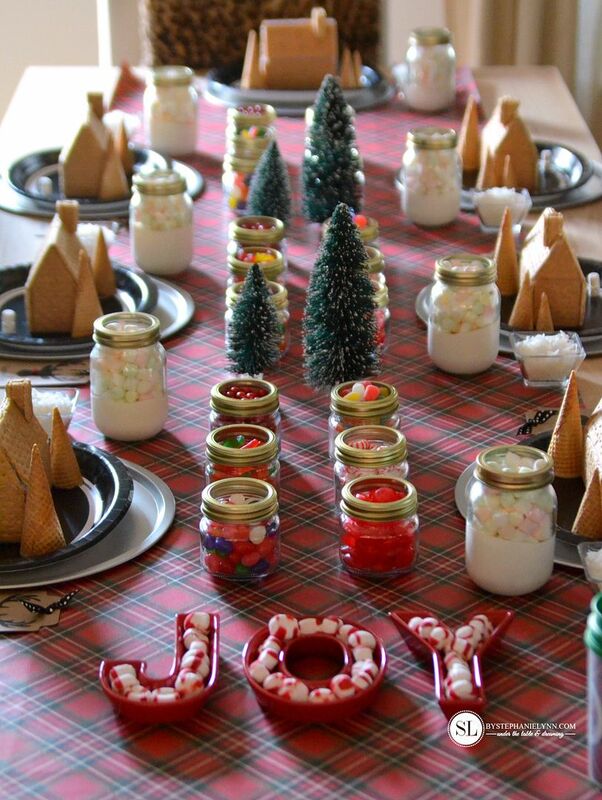 To keep things simple, canned icing was used for the decorating. It holds the toppings well and dries hard too, keeping everything in place. This year, we put the icing in individual, disposable decorating bags. The bags were twisted and tied with bakers twine to prevent the icing from squirting out of the top. 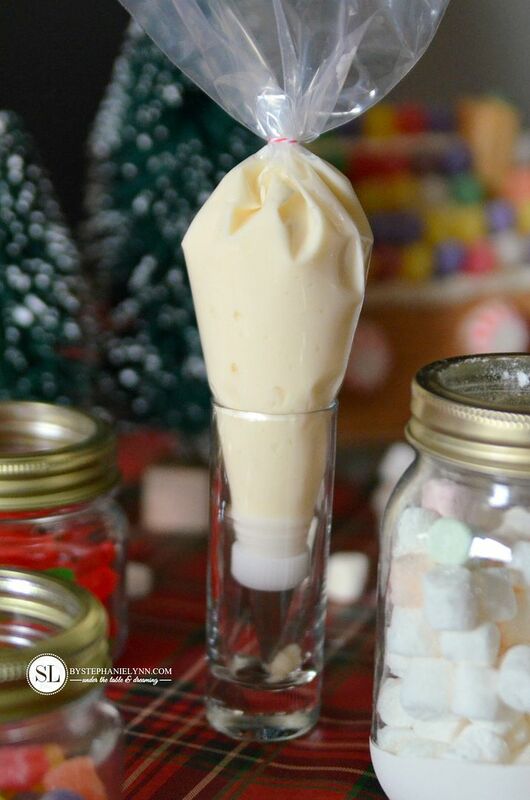 Mini shot glasses were used to hold the bags upright and catch any stray icing. 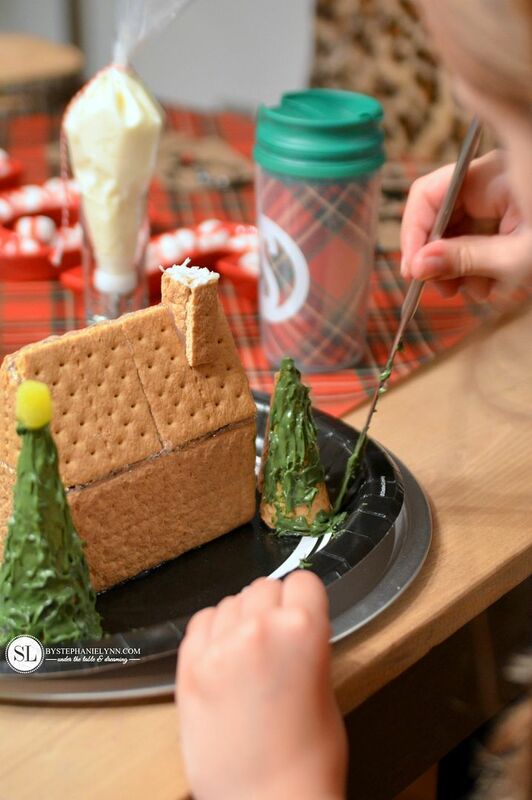 If you do not have the bags or decorator tips on hand, the icing works just as well – spread on with a butter knife. 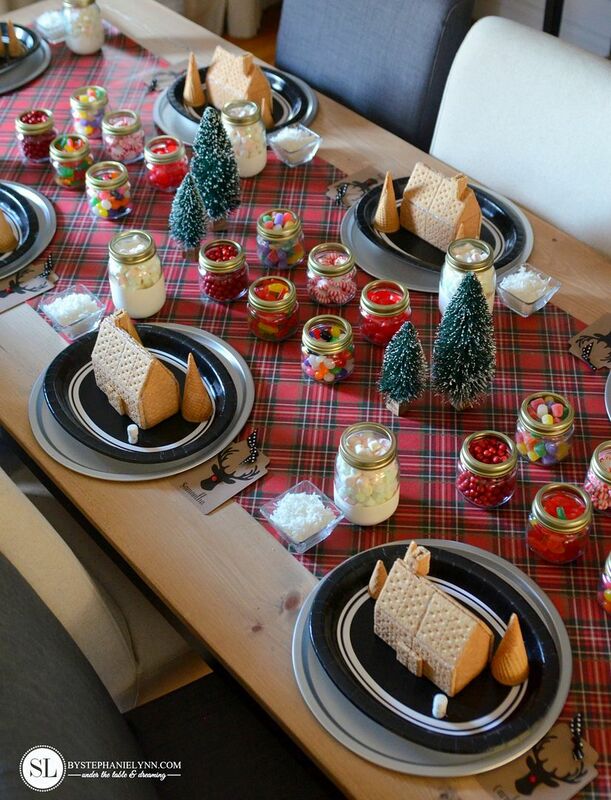 A roll of plaid wrapping paper was used as a festive ‘runner’ for the table. 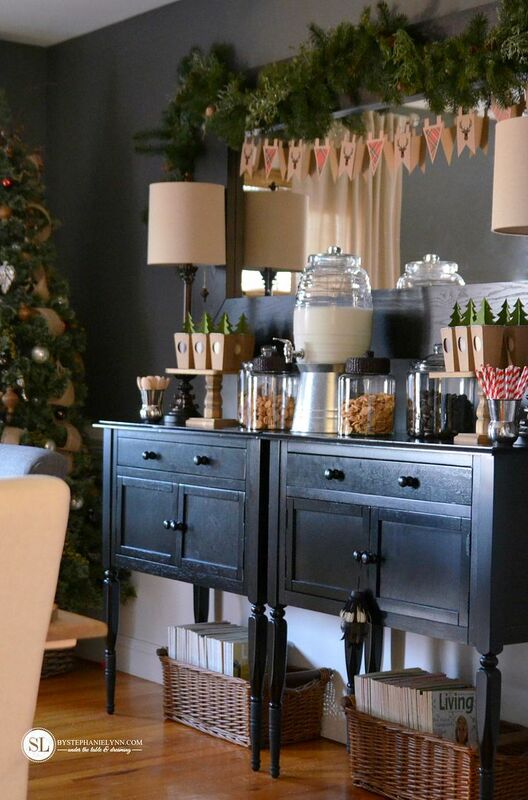 It’s a simple way to add a decorative touch and since it is disposable, it’s worry free. Inexpensive pizza pans were used as ‘chargers’ at each place setting. The pans help contain all of the extra toppings that may not make it on the houses. 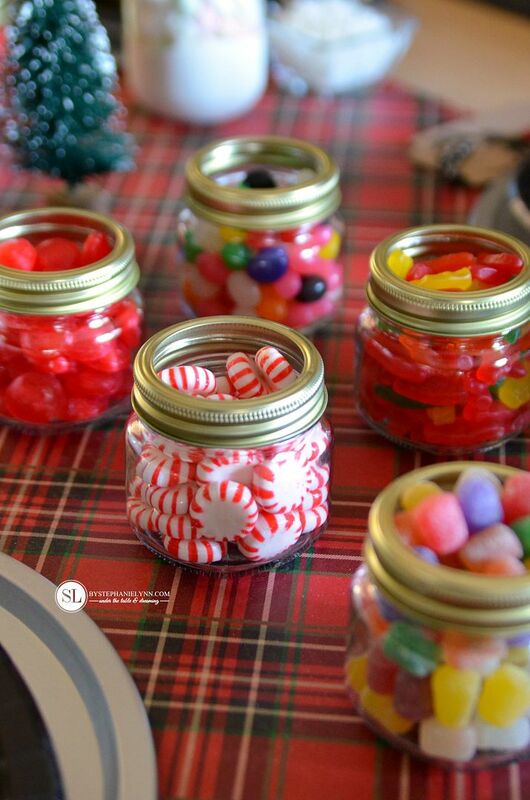 Of course a party would not be complete without some goodies to snack on. 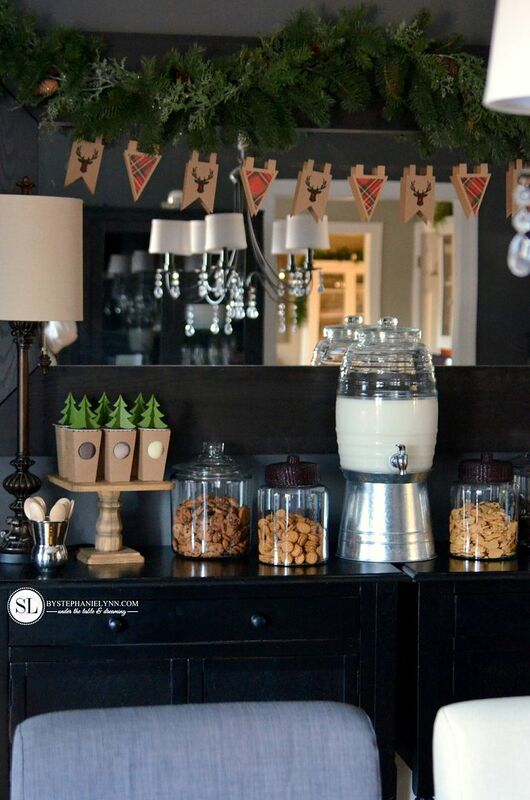 For a festive and fun display, a Snack Pack Pudding Bar was set up – complete with cookies and milk. 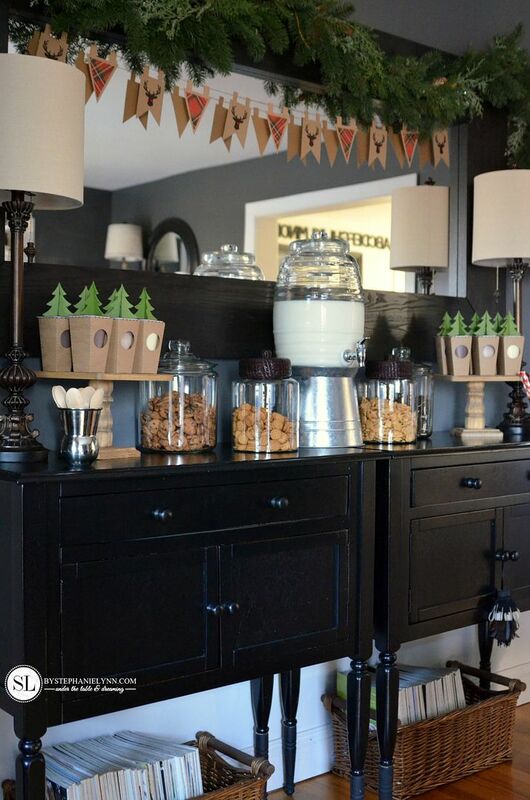 Kids, and adults, both love the idea of self-serve food displays – especially when there are no limitations on their creativity. 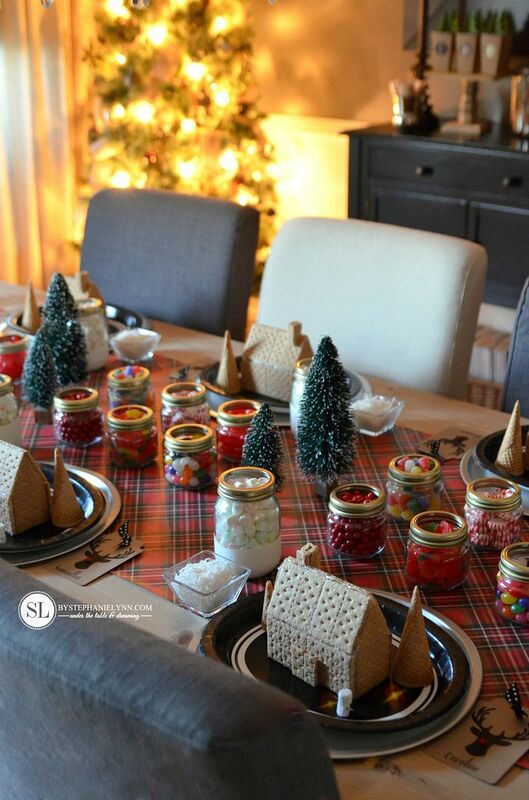 Snack Pack Pudding cups and a mix of cookies are all that is needed for this simple, convenient, and care-free set up. 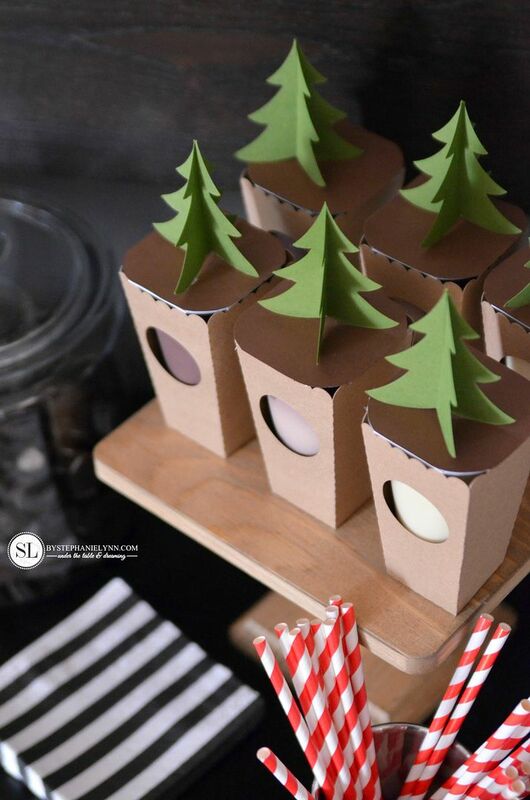 The Snack Packs were dressed up with some paper wraps and toppers to keep with the festive theme. It’s incredibly easy to set up. 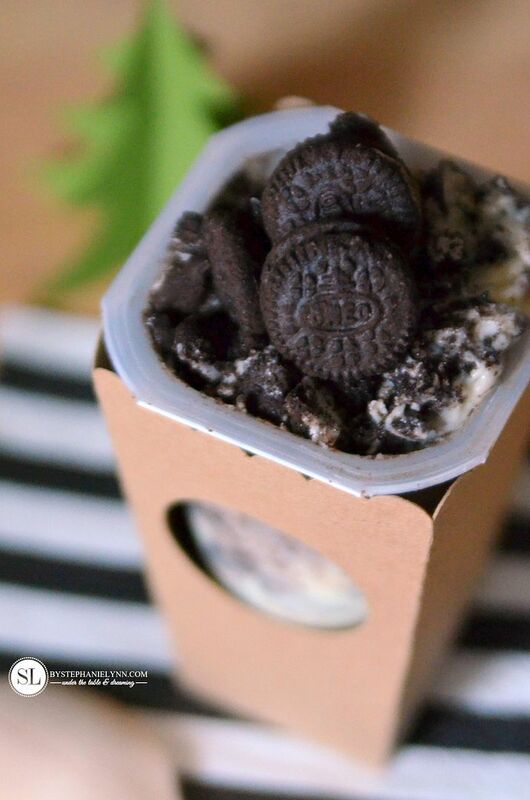 Pre-packaged cookies and Snack Pack Pudding Cups – it doesn’t get much easier than this. For easy mixing, we choose a variety of Mini Snak-Sacs. The bar does not need to be maintained. Once it is set up, the host is free to enjoy the festivities. 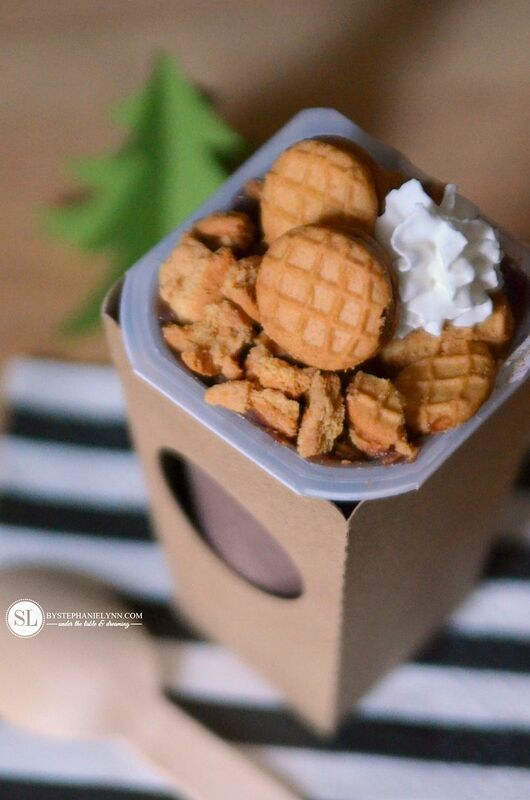 The Snack Pack Pudding Cups double as a take home favors – if there are any left over after the party. 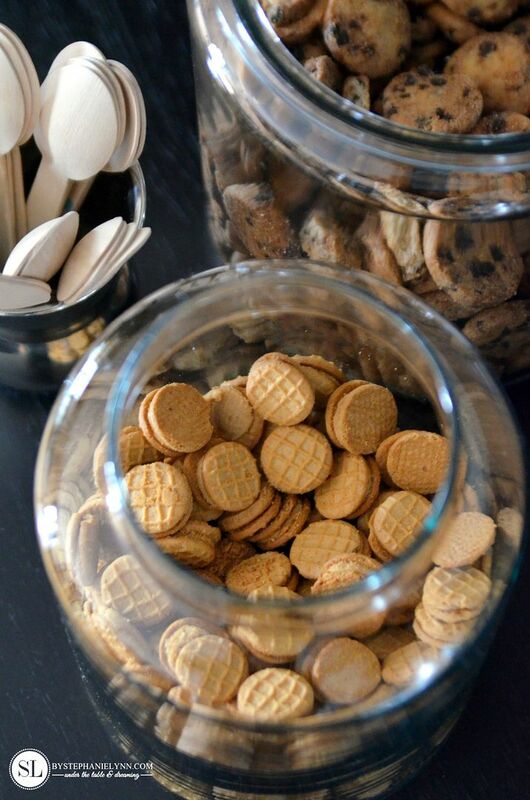 The decorative wrappers were designed tall enough to hold the Snack Pack Pudding Cups with some extra room at the bottom of the container to hold some cookies. 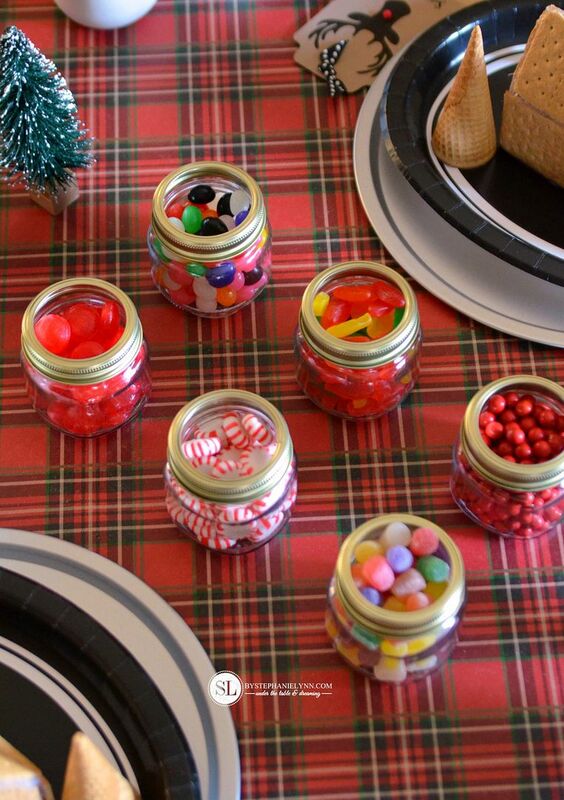 This way the guests can enjoy a mixed combination once they are home – in a convenient all in one package. 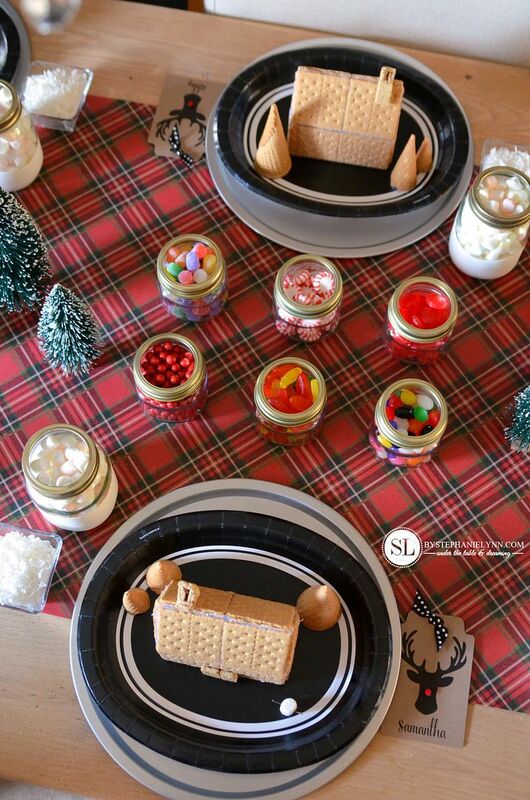 Our pudding bar contained three varieties of Super Snack Packs (Chocolate, Chocolate Vanilla Combo, and Vanilla), along with four different Mini Snak-Saks cookie mix-ins. 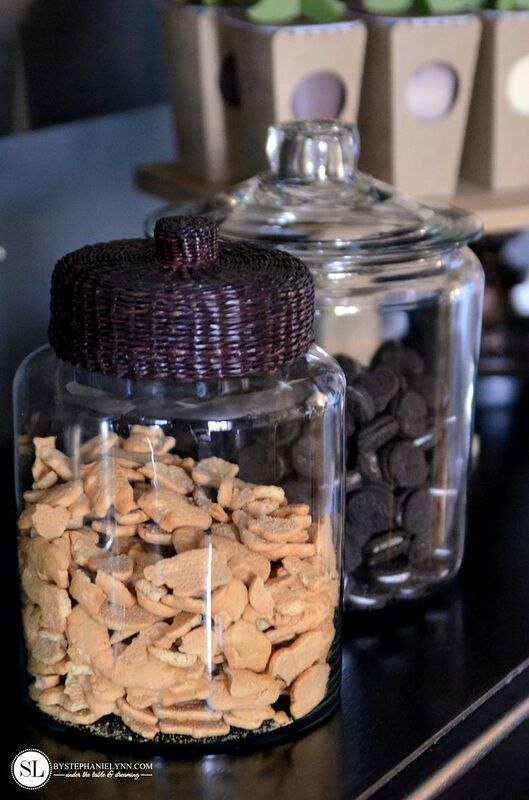 For a clean and cohesive look, glass jars were used to display the cookies and our homemade wooden cake stands were used to add some height to the Snack Packs. 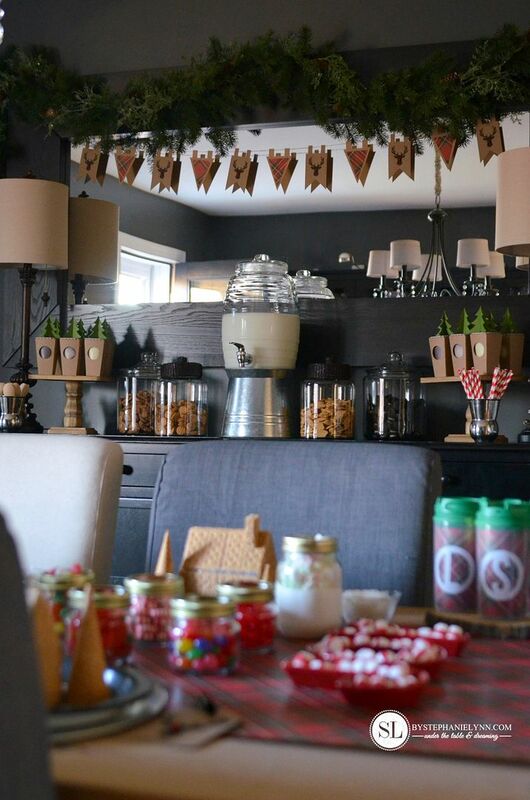 A festive banner was hung above the buffet to coordinate with the simplistic decor. 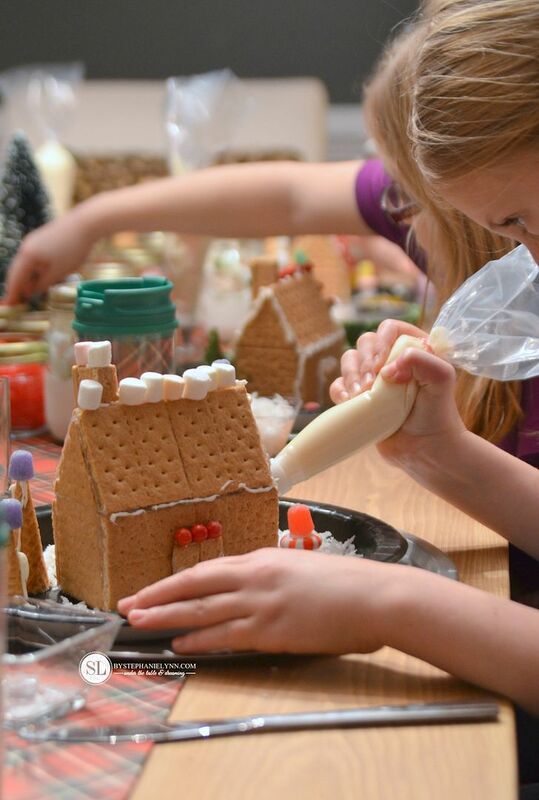 Are you ready to have some good old-fashion family fun this season and make some memories in the process? The tags were created using the printable template above. We added each child’s name to bottom and used them as place cards at the table. The design can be printed using any type of cardstock. We used plain kraft paper cardstock. Decorative ribbon was added to the top of the tag – by punching two holes through the cardstock, with a hole puncher, and threading through the ribbon. 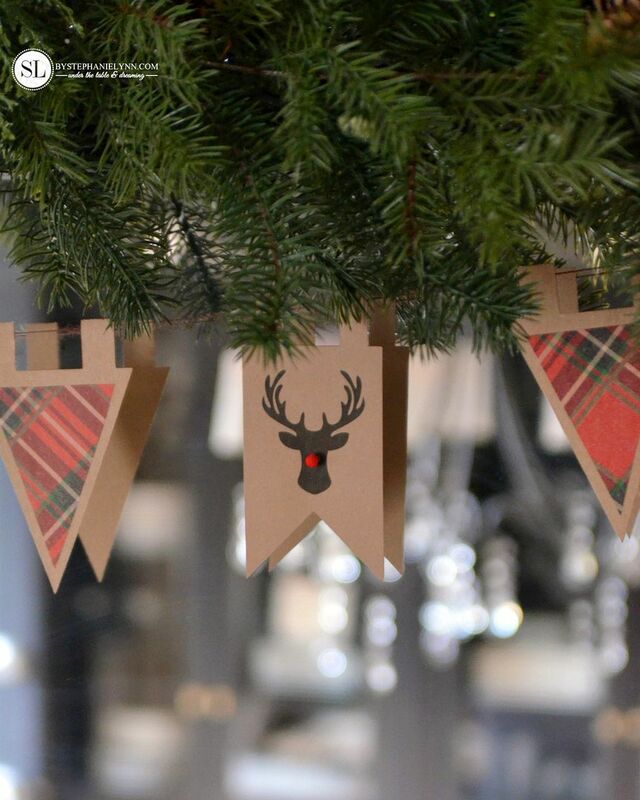 For a festive touch, mini red pom pom balls were glued on the tag, to transform the deer head into Rudolph. 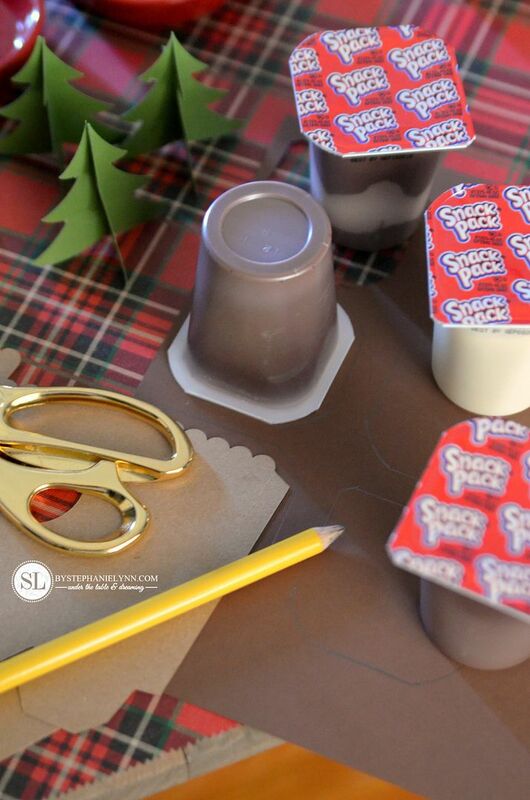 The Snack Pack Pudding Cups were transformed into part of the decor by wrapping them with the free printable templates above. 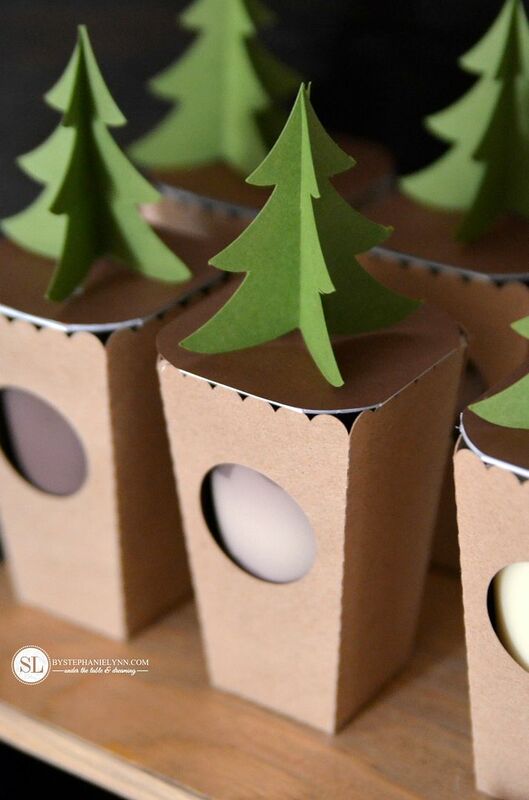 The tree toppers were created using plain green cardstock and plain kraft paper cardstock for the actual wrapper. The tops of the Snack Packs were covered with brown cardstock. This was done by simply tracing the tops on the cardstock and cutting them out. 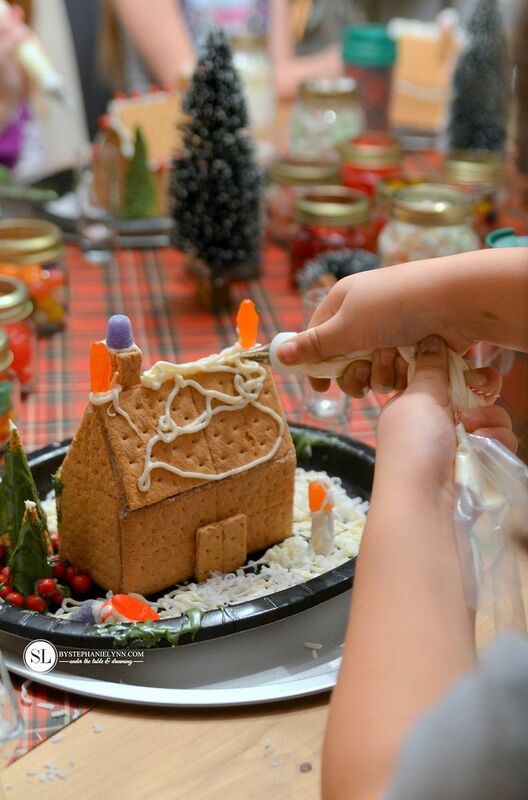 A touch of hot glue was used to assemble everything and hold it into place. Note: These templates are design for the larger 5.5oz Snack Pack Pudding Cups. The banner was created as well, using the printable templates above. 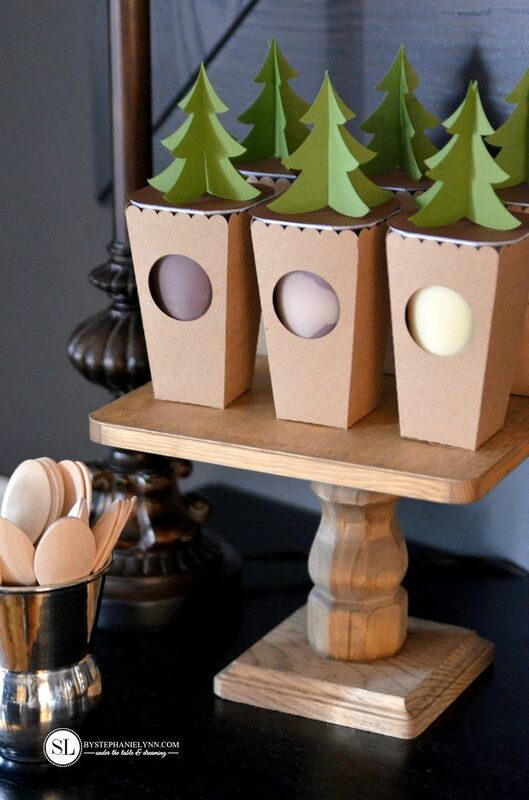 To coordinate with the rest of the decor, the templates were printed on plain kraft paper cardstock. We added a touch of the wrapping paper to the pennant banners. The same wrapping paper used for the table runner. There is a template included to cut out the smaller triangles. 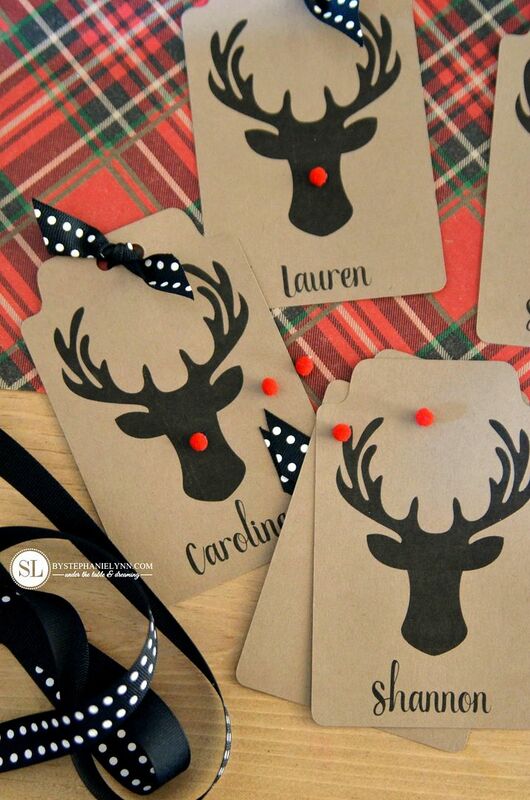 Red mini pom poms were also added to the deer head banner – to match the place card tags. The banner is simply assembled by folding the pennant tabs over a piece of twine or ribbon, and holding them in place with a touch of hot glue. 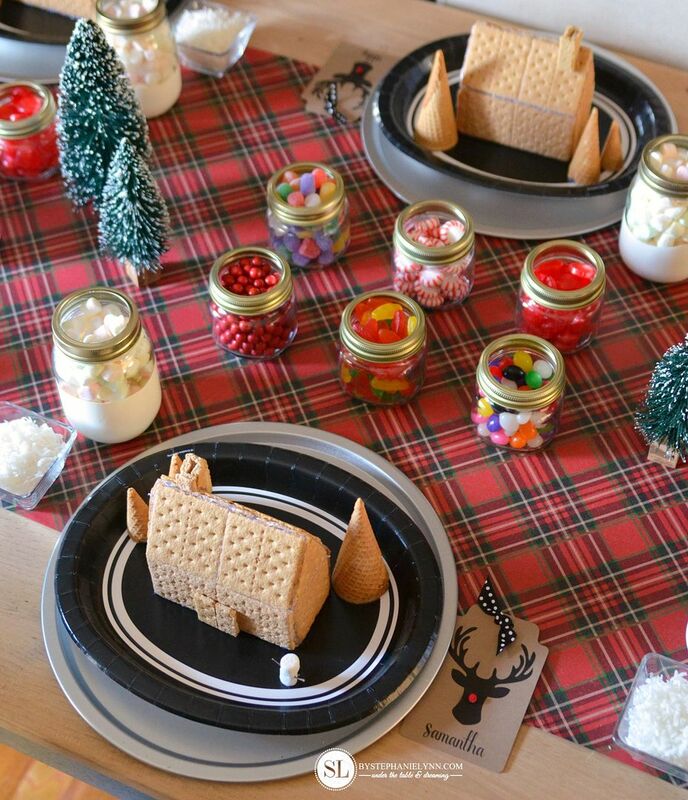 The Snack Pack Pudding Cups, Snak-Sac Cookies, along with all of the decorative toppings for the gingerbread houses were conveniently picked up right at our local WALMART. 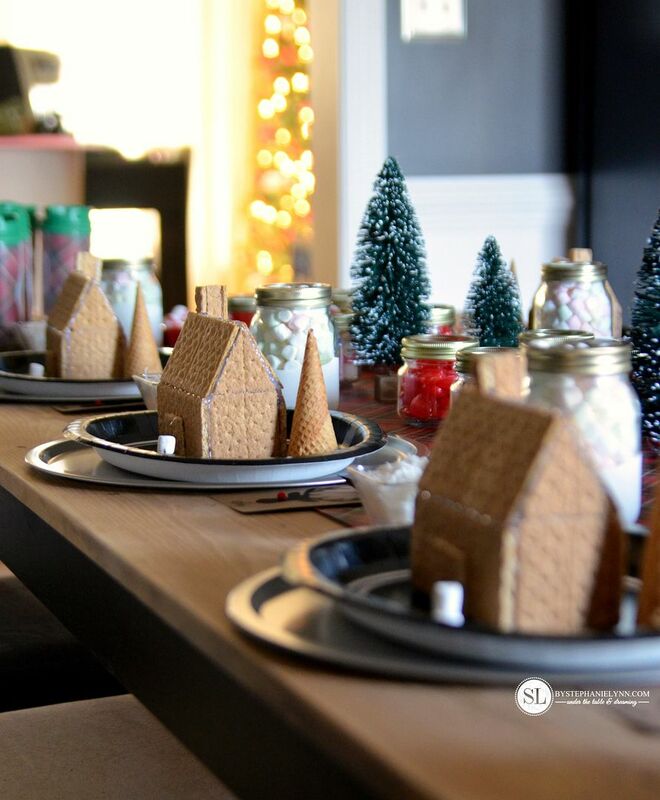 To help get your Gingerbread House Decorating Party & Pudding Bar started, click here for a special $1 off Snack Pack Pudding Cup coupon. i so loved this! 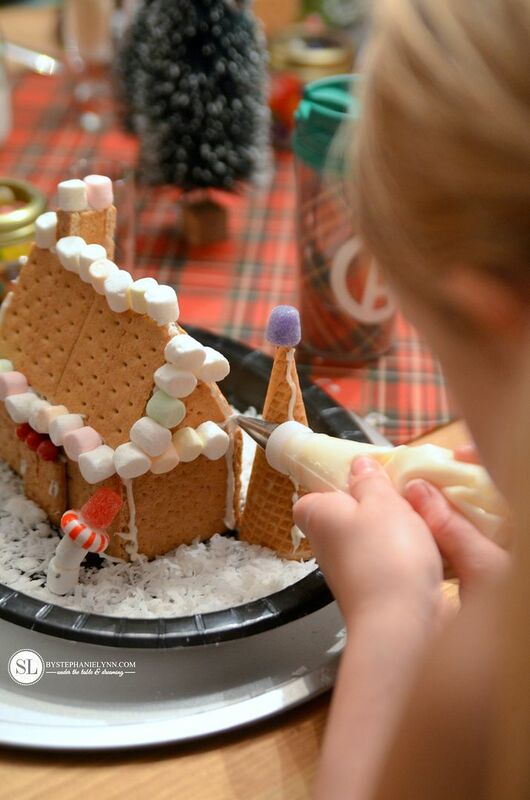 we do a gingerbread kit every year and have done regular gingerbread houses as well as the graham cracker version for years. 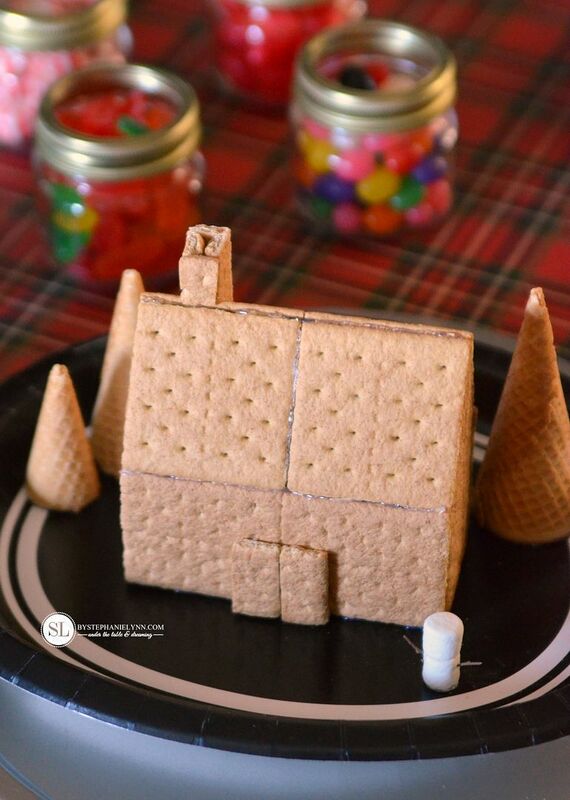 one year i did the graham cracker houses with a group of church nursery children. i made the houses out of the halves of crackers instead of the whole ones. i found that putting the crackers in the microwave for about 30 seconds made the crackers soft enough to cut without them breaking. thank you for the awesome printables. the idea with the pudding cup holders is just genius. thank you for always inspiring me. happiest holiday wishes to you and yours. So much fun and so pretty. I love that your parties are always classy and inviting. Beautiful work!